This luxury 2017 ABI Blenheim, sleeps 6 in 3 bedrooms (1 x double and 2 x twin) with ensuite to master bedroom and a family shower room. Ideally located in the quieter Woodlands area, close to the leisure complex and a short walk to the park or take advantage of the woodlands shuttle bus. 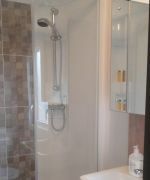 The caravan is fully double glazed, with domestic central heating for your comfort. There is a TV in master bedroom and all rooms have USB charging points. The spacious lounge has a TV and DVD with feature electric fire. The fully fitted kitchen diner has a full size integrated fridge freezer, gas oven, grill and hob as well as microwave oven and grill. Also equipped with all the usual appliances, kettle, toaster, iron, pots and pans. A fire extinguisher, fire blanket, carbon monoxide and smoke alarms fitted for your safety. The caravan is personally cleaned and checked by owners. Beds are made up for your arrival, however, if you prefer, you can bring your own bedding. Please state preference when booking. 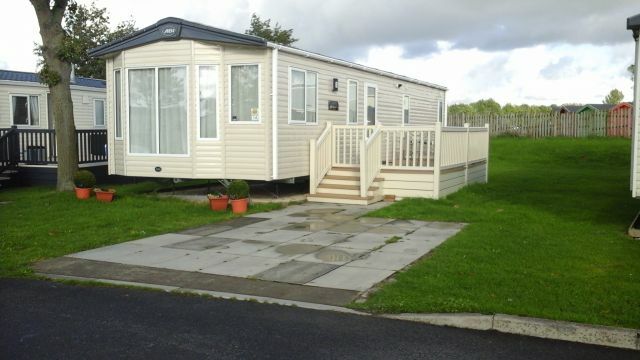 Outside is a 16ft x 8ft veranda and parking is on hard standing at the side of the caravan. Bookings are for full weeks, Saturday to Saturday in the high season. Short breaks available early and late season. 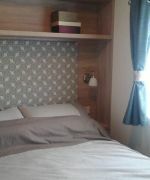 A £100 non refundable deposit secures your booking and full payment is required 6 weeks prior to your stay. Theme park passes must be purchased from Reception upon arrival.